One Stop Automotive is your best source for quick, local and reliable auto repair. We care about your safety and will save you money and time. For over 26 years we have served Arizona’s foreign and domestic auto repair needs. We offer unbeatable auto repair prices and reliable, efficient service in our state of the art repair facility. We also have Senior Citizen, Military and Student Auto Repair Discounts. One Stop Automotive offers state-of-the-art computer technology and friendly service. We also provide an Auto Repair Service Guarantee for all of the work done with us. Our specialty is correct and accurate Diagnostics and emissions repair by ASE Certified Technicians. No auto repair job is too small or too big for One Stop Automotive. One Stop Automotive is my go to auto shop for all my repairs. They don’t push when they find something that doesn’t need to be fixed immediately and give me a good idea how much time I have before a problem needs to be fixed. The staff is knowledgeable and the management looks for ways to keep costs down for valued repeat costumers. Fabulous service, fast and super friendly. Excellent repair service and turnaround time. I have been getting my vehicles serviced here for over 10 years and they are trustworthy and knowledgeable. I HAVE BEEN USING ONESTOP FOR ABOUT 4 YEARS NOW WITH MANY VEHICLE REPAIRS AND HAVE ALWAYS HAD EXCELLENT RESULTS. RANDALL AND MATT ALWAYS MAKE IT A POINT TO GET THE JOB DONE QUICKLY WITH OUTSTANDING RESULTS. HONESTY WITH SENSIBLE COST OF REPAIRS IS THEIR FORTAY WHICH IS HARD TO FIND NOWDAYS WITH VEHICLE REPAIR SHOPS AND MECHANICS. WOULD NOT RECOMMEND ANYONE ELSE BUT ONESTOP. Fantastic Service Team. Thorough check up on auto then reasonable prices on required Services. Completed as promised and they even thru in a free car wash. Excellent service. Highly recommend. They work hard to get everything right. One Stop Automotive did a pre-purchase inspection and I could not have been more pleased with their service. Very thorough and for only $59.99. I bought this one as a used car, so I am not sure what repairment this one needs. The shop members are able to pick up skeptical point(small leak or noise etc….) and fix it before it breaks. It helps us a lot. Great service. Customer service is top notch. Highly recommend. I couldn’t have been more pleased with my experience. The services were done exactly as requested, and other issues or recommendations were explained and all of my questions answered. I love One Stop Automotive. The owner is an extremely honest businessman, and he will always do whatever it takes to take care of any problems. I recommend them to everyone I know. I have been going there for years. After physically going to 6 transmission shops that friends had recommended, I stop at 1 Stop Automotive on south Craycroft. I had played golf about 6 weeks prior and the fourth golfer assigned to us was a guy name Matt. After awhile, I asked him what he did and he said he ran an automotive shop. He gave me a business card. 6 weeks later my ford developed some fatal flaws. He remembered me and within 10 minutes he gave me a computer driven estimate of the total rebuild. None of the other shops I had visited did this for me. All they could do was give me range of what it might cost. I went with 1 Stop Automotive and picked up my repaired vehicle for the quoted price. Actually, it was a few bucks less. Go figure? My first experience with 1 Stop was as pleasant as could be. Hopefully, you’ll get the same treatment. As always, Randall and Matt did a terrific job of repairing my car. I wouldn’t take my car anywhere else! Awesome guys! I’ve been so busy taking care of the other cars that I neglected mine. Randall, if you hadn’t recommended flushing and changing fluids last month, I’d be stranded on the side of the highway somewhere. How many people can say they’re happy to have something break in the shop? But having the radiator fall apart in the desert or the timing belt snap on the road, those are things I REALLY want to avoid. So I’m glad it happened during preventative maintenance. My thanks for always taking care of us. I had an oil change and a courtesy check done at One Stop Auto in advance of traveling on a family vacation. The appointment was made promptly, Randall transported me to and from my place of work, and he and Matt couldn’t have been any more pleasant and helpful. The vehicle needed struts and brakes and it now drives smoothly. It was literally the best experience I’ve ever had servicing a vehicle. The shop is impeccably clean and my vehicle was even washed before pick-up. This is a five star shop! This was the BEST customer service I have ever experienced. I was so pleased with my experience with 1 Stop Automotive, Tucson AZ. I am a female college student at the U of A and was in need of a trustworthy car service. They were honest, kept me updated, explained things to me clearly, and made me feel so comfortable. When I called to make an appointment, they said they treat everyone as family and that is exactly what they did. I cannot give enough praise to Matt who helped me out and the staff that went above and beyond. I highly recommend this place. ps: there is a discount for U of A students! Received honest service. Also was transported from and to shop. Reliable service and reasonable prices. Great service and workmanship. I had communication with issues throughout, recommendations as to things that should be fixed now and things that could wait. Would recommend to anyone. Matt and Randall can be trusted to do excellent repairs at a reasonable price. We wanted to know if our daughter’s 2000 Toyota could be made safe and dependable. Matt and Randall checked out everything and did the needed repairs at their estimated cost. The car runs like new. This is our second positive experience with One Stop Automotive. I trust Randall and Matt at One Stop Auto. They have serviced my car for a few years now, and I have always been satisfied. This is the only place that I take the car. They are so honest and trust worthy. I tell everyone about the service your receive here, they continually go above and beyond. If you want to have your vehicle repaired without feeling like you have been taken advantage of this is the place to go. Customers come first! Once again a big Shout Out to my favorite 2 guys. Thank you both Randall and Matt for making me feel like a valued customer. Great diagnostic and repair facility. Fast, friendly and reasonably priced. I needed brake service on my truck and wasn’t sure where to take it. I did some research and read good things about One Stop, so I decided to give them a try. The reviews were right!! Top notch work. Fast diagnosis, timely repair, clean, courteous people, fair pricing. They are my go-to guys from now on! Randall and his team are extremely professional, prompt, and thorough. I am so glad I was referred to them, as I felt assured I wouldn’t be taken advantage of! These gentlemen are great, they do it correct and in a timely manner the first time, they are honest and priced fairly. When I have a repair issue this is the only shop I go to in Tucson. These guys do it all, they do it right, they are honesty and the prices are fair. I had a non-starting vehicle and with a call they had an inexpensive tow lined up, diagnosed the situation, reminded me of other maintenance issues but did not pressure or attempt to oversell. Highly recommend! Another great experience at One Stop Automotive! They did a great job and came in under estimate. Matt and Randall are simply the best there is! I have been coming to One Stop Automotive for my car maintenance needs for about a year now and am very impressed with how professional and honest they are. Yesterday I came in because my check engine light was on. It turns out the intake air tube was cracked and leaking. They showed me on my car exactly what was wrong, provided a reasonable estimate and had it fixed in 20 minutes. I also appreciate the time they spent going over some recommendations for maintenance to keep my car running and even gave me a printout. At the end they even gave me a $25 gift card and asked that I try them out for my next oil change. Will definitely be back. I have had my car forever and no one touches it but One Stop Auto….. Randal and his crew are the best. I have had my cars serviced here for 15 plus years and I could not be more pleased. They keep track of what my car needs done at mile check points – saves me keeping track of them. They guarantee their work. They are very trustworthy and make you feel that your problem is top priority no matter how small or large the repair. Girls! You will feel just as important as the Guys. Just love the service, price, and friendliness. Took my vehicle in for oil change and air filters changed, I’m pleased with the service. This shop is so honest and charge fair prices. They explain what my car needs in terms that I can understand. Recently the car had an intermittent problem which the computer hadn’t yet identified. They offered to stay late so the tow truck could get it there and it could go in their garage. After several visits for this elusive problem, the computer sent a signal identifying the problem. I was in and out in an hour. Then just yesterday I had a different issue where some cable came off some part, but basically the car wouldn’t engage into gear. Five minutes before closing for the weekend, Matt offered to come to where I was and check it out. He fixed it so I could get through the weekend and bring it in on Monday. No charge for doing this. The guys at One Stop automotive keep my 2002 rav4 with nearly 200,000 miles in great shape to keep rolling on. Thanks guys! I brought my wife’s Crosstrek in for an oil change. It was VERY fast and VERY easy. Awesome staff and amazing service. I have used One Stop Automotive 4 times for 3 different vehicles. I have been absolutely pleased each visit. I have complete confidence in their ability to investigate any issue/concern, advise and properly fix the issue/concern. Their customer service is first class and they provide personalized attention and service. Great customer service, honest , and helpful . Randall and the gentlemen at One Stop Auto always give us a reasonable price and knowledgeable repairs/suggestions. Our whole family has been going to them for ten years. I highly recommend this garage! I cannot say enough about the service and attention to detail that Randall and Matt provide to my family. We have been customers for 12 years, and have had service performed on four separate vehicles. The diagnostics, the careful explanation of the proposed repairs, and the prices are always fair and represent good value. They stand behind their work, are flexible with pickups and drop offs, and just good human beings. What a pleasure to have them as a service provider. We have sent dozens of friends and family members to them, and in each instance they have become years-long customers, just like we did. We were referrred to them by a large dealership that had used them for years for their contract work—and that recommendation has turned out to be superb. I took my tuck to get my A/C looked at and was greeted by Matt which helped me though out the whole process. He was awesome very friendly and he knew his stuff. They were able to get my truck in and out the same day. I was very happy with the service and friendly staff. I would highly recommend this place to anyone. We have been using OneStop since 2009. 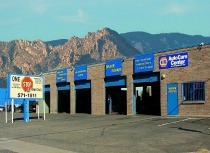 They have always given us the best price and service you can find in Tucson. They even offer a military discount. My car is always fixed and they even call to check on the service a few days later. I have never been disappointed and have even received calls from them thanking us for our business. These days you don’t find customer service like that. Great service at a fair price. They really go the extra mile to make sure you are satisfied with their work. We’ve used One Stop for over 10 years now and couldn’t be happier. The service is personal, they take the time to explain if you have questions and are reasonably priced. They’ve help with looking for a new car and selling old ones as well as making decisions about when it’s time to say goodbye to the old one. Randall Rocks! At last I have found an honest garage. I believe them when they say “you don’t need this” but “you do need this”. How many places will tell you you don’t need something? We’ve now run all of our cars through over the last year and we’ve been happy with the results. We did have a small issue, but it was resolved nicely and we were quite happy. No more dealer repairs for us! We’ll be staying with One Stop from now on and so will the people who we have recommended to them. We’ve been using One Stop for over 10 years now and couldn’t be happier. Service, pricing, all around excellent! The only place I will take my car, I trust thier opinion and trust that they won’t do anything to my car that I don’t need! Definitely reccomend! They always get me in as soon as they open so I can be out using my car daily. Totally impressed with their depth of service and friendliness. I won’t take my cars anywhere else! One Stop were recommended to me and I’m glad to say they lived up to the promise. They managed to fit me in fairly quickly and check out the issue with my car. They took the time to go through and explain exactly what needed to be done, and gave me multiple options to fix the problem. When I went to collect the car the price was even lower than quoted because Matt had managed to find the part cheaper at a different supplier. They definitely put in the extra effort to make sure you’re happy. Easily the best auto shop I’ve been to, I’ll definitely continue to use them. Finally a shop we can take our vehicles to and get honest mechanics working on them. They always call us with the estimate ahead of time and keep us in the loop on the issues. Very friendly atmosphere as well. Everyone was professional. They took care of the issue that caused the engine light to come on and notified my of other pending repairs. I really appreciated the transportation to and from work while they were working on my vehicle. Been taking my Sonata there for years to keep it running. Thanks Matt for working on it. Thank Guys you’re the best ! I’ve taken my car to One Stop for over 2 years & have been completely satisfied each time. They are the best at keeping you informed on the progress & if needed troubles arise their quick to inform you & create a solution. Their the best in town. Randall is an excellent manager. Matt’s the man with the skillzz. I’ve taken 10 vehicles to One Stop Automotive over the past 15 years. I get great service and benee’s just about every visit. The shop does honest, reliable work that they always stand behind; I’m sure there’s a written guarantee of the work…. but guarantees aren’t something I’ve had to rely on, especially when work is done right the first time. I sometimes question the completeness of some of the other techs there. Occasionally I might find an “un-buttoned” button that wasn’t buttoned-up properly. But, overall, just speaking in terms of technician skill, Matt is a professional, as is Randall, the owner. I’ve dropped about 30 to 40k over the past 15 years for at least 8 vehicles. I’ve always been satisfied that that was $$ well spent. I highly recommend this shop. I refer all my relatives and friends to One Stop. They’ve never let me down. Thank you Randall and Matt for your many years of awesome service for my family’s vehicles. The best shop in Tucson! My first visit to One Stop Automotive has changed my attitude about repair shops. Randall and Matt are awesome. Matt personally worked on my vehicle and was completely transparent with the repair, the condition of my vehicle, and a future repair which is needed. Nothing but an amazing experience and their customer service is, hands down, the best! They have a customer for life!! I’ll start this review off by saying that Randall, Matt and staff are truly great people. I have been taking my cars here for the last 9 years. I’ve always been greeted with a smile and treated like family. The shop always does great work and is straight forward. I would recommend One Stop Automotive to anyone that is looking to get their vehicle worked on. Had no AC, these guys jump on it and in one hour found the problem. Call back at noon, problem was fixed. Kept me inform of the progress. Highly recommend. This was my third interaction with One Stop Auto. I have been very pleased with every single transaction with Randall. My first experience was in December 2016 when my headlamp in my 2012 Traverse went out. I took it to my local auto parts store, which is always very helpful in changing bulbs, wipers, batteries, etc. However, due to a seal engine compartment, my headlamps were unreachable. I was worried about finding a shop that would charge a reasonable price. Just then, I drove past One Stop Auto and it felt like the right place to call. The next day, I called and spoke to Randall. He explained how to reach the headlamp and it was quite extensive. However, he gave me a fair quote and took the vehicle in right away. I had my car back within hours. The second interaction was after trying to do some home repairs on my daughter’s 1991 Geo Prizm. The car would not start afterwards!! (Go figure!) I again called Randall and explained exactly what I had done and what the car was doing. I towed it to One Stop and found out the Serpentine Belt had broken and they had it replaced by the next morning. This last interaction, my daughter’s Geo started pouring out coolant. Again, one call to Randall and he had us on our way to his shop. They replaced the Radiator and we had it back the next morning at a reasonable price. My daughter is a student at the U of A and Randall has always been more than fair in his prices. He does a thorough check and gives you all the information needed to make a decision. Thank you for being such a reliable, honest, courteous shop!! We recently brought in our two vehicles for LOF’s. Randall and Matt are a pleasure to work with especially in today’s society. Having come from a family who in years past owned a small tire dealership and auto repair, it was great to find one that is honest, and does meticulous work at a fair price. May the business continue to grow and do well. Finding a reliable shop to service your vehicle when away from home can be challenging. Selected this business based on the reviews and was not disappointed. The customer care and service were excellent. Highly recommend this business. My car is my baby, I try to take good care of it. Randall and his gang does great work and is to be trusted. They are fair and good people and explain things to me. I would recommend them to anyone, as I do. I went to One Stop Automotive for a 2nd opinion on some work that another shop said that I needed. The first estimate was around $1100. Matt checked it out, and it didn’t need all this work at this time. So my car was inspected, repaired, and back on the road the same day. Matt and Randall were very honest, up-front, and really seemed to be honest and fair. When you are 76 and a woman, sometimes people try to take advantage of you. I have now found me “2 forever mechanics”. I just moved to town and needed to register my vehicle, I needed it to pass the emissions test and it didnt. There was something wrong with the sensors. I saw One Stop Automotive on my way home, the garage was full so i knew they were good at what they did. I stopped talked to Randall, took a business card and returned a week later. They were able to fix all the issues with the sensors. They called and kept me up to date on the progress and they were super helpful, friendly and good down to earth people. I am so thankful for them and have just made two new friends! I recommend them to anyone!!!! We have been using One Stop automotive for over 15 years now and will continue to do so. The personal call and give us information on what needs to be done, time frame and costs. We won’t go anywhere else to have repairs done on our vehicles. I would highly recommend going to these guys! Randall and Matt are seriously the best and have always taken care of my car regardless of time or amount of customers. They’re so helpful and patient! The best guys out there for sure! If you need anything, these are your guys! Recommended by a friend, I have always had great service with One Stop Automotive. I have been going to them for over 2 years and will continue to do so. Amazing service during a difficult time. I purchased a vehicle from a local used car dealership and soon found myself back at the dealership a total of 9 times to their “mechanic” before they refused to repair issues with my car that were present during the warranty period. This is my second trip to One Stop as we knew the vehicle would need some serious “love” and repairs. Once again Matt was awesome and I thank God everyday for Matt and owner Randall!!! They were able to pin point issues with the fuel system within an hour and ordered parts from the dealer as they searched high and low for local or online parts that could not be found. Since it was so close to the holiday they took very good care of my car and kept it safe until parts arrived. They called daily to keep me posted on the status of parts and to see if there was anything we needed as we were now without a vehicle. One parts came in from the dealer the car was up and running in no time. No sure what else this car will present with as far as repair issues due to the used dealer I purchased from but I know no one else but One Stop will take care of our family of cars. They do not charge or attempt to charge for u needed parts or labor. Fuel pump labor called for two hours and Matt had it done in less than an hour and charged for such. This veteran owned business is more than honest and reliable. Most say diamonds are a girls best friend however for this single mom raising a son and taking care of two parents good mechanics are this girls best friend!! Thank you Matt and Randall for taking on such a daunting task of a car and issues that were not yours. We don’t know what on earth we would have done without you!!!! If you want honest, reliable, experienced, and service friendly auto repairs One Stop is it!!!!!! You’re more than a customer here. You’re family. Amazing mechanics!!!! After a horrible experience with a used car dealership and their mechanics Matt and Randall at One Stop Auto were able to diagnose and repairs issues the dealership could not “recreate” during the warranty period. Diagnosis was very quick and my vehicle was repaired much faster than I expected. Matt is amazing!!!! The shop did not try to push repairs that were not needed and are very focused on keeping costs as low as possible for their customers. Very honest, very reliable, very service oriented, kind, and professional. Due to the dealership I purchased from my Fusion will need some attention and you can bet One Stop is our auto care home for life!!!! I can say they truly treat you not just like a customer but as family. Thank you Matt and Randall!!!!! Matt and Randall run a fine shop. I was very pleased with the safety check list they performed on our car. It is good to know that they have our safety on their list of concerns. Their service was prompt and reasonably priced. I really like these guys. Straightforward honest mechanics. Not over priced. Fix the problem and give really good advice. Its taken me a while to really trust a shop in Tucson. It’s a good feeling. My most honest experience in over 33 years of automobile lies in Tucson. I was taken seriously and respectfully. The men where patient and honest. Their work fixed my auto problem, Thank you Matt and Randall. Was told I had to take my truck into the Dealership because that was the only place to fix it, they said they were going to keep it for three days before even working on it, and that they would give me a discount to have a rental.. the prices were outraged as well! But I came to One Stop Automotive and they fixed it that same day, outstanding customer service, broke every detail about the problem down to my understanding and the price was very well accepted! Thank you guys for the service! I went to get air in my tires at Discount tires and the personnel there advised me that I needed rear brakes! I’m so tired of getting ripped off so I decided to use garagefly.com for a reputable shop in the area I was. I called One Stop Automotive and was pleasantly surprised to be able to get my car in for service the same day. The staff was very personable yet professional, always a good combination. They gave me a honest assessment of the repair needed and courtesy check of other things needing repair. What I appreciated was the non-pressure of getting the “other repair” being I am recently widowed and finances are tight right now. The owner was very nice and everything was as promised. I hope I will be able to continue to use them when needed. When I first moved to Tucson, I owned a 2007 Prius with a 6 CD player that had stopped working. Called almost every auto and audio shop in Tucson, including the dealer, and the cost to replace was very expensive. When I called One Stop, Randall told me he could find a pre-owned CD player and replace for a very reasonable fee, which he did. He’s been my mechanic ever since, even though I drive almost one hour from my home. Fast affordable knowledge and work from people who care. I was hearing my rear breaks making noise. I knew I was needing to get it in the shop. I couldn’t bring myself to take my car to a chain for the repairs. I pass this shop everyday and it always has cars that they are working on. I googled the shop and all the reviews were great and it’s A+ rating from BBB was the clincher for me. And the money stays local. Work was done in one day while I was at work. This will be my go to shop for all my car care needs. One Stop Automotive saved the day! I had run over a coyote and heard a horrible sound near my front right tire. Turns out it was a few loose bolts that were easily repaired. Matt was so attentive, explained all that was done to my car. I had an oil change and provided some of the oil–no problem. Two filters needed to be replaced. They detected some axle work that needs to be done and checked with my warranty company while I waited. Approved! I trust these guys with my special car. They are the BEST. Read the reviews online and decided to drive over to the shop right after it opened. Had a problem with the car misfiring They diagnosed the problem right away and gave me an estimate. They told me it could be fixed within a couple of hours. They were true to their word and I was out of there within two hours at an honest price. My car had an issue with the AC was not working. I took the car in to the shop and Randall was able to quickly identify the issue and replace the faulty part with a new one. within 30 minutes I was able to drive out with the issue resolved. The service was very prompt and Randall was very informative. We have taken our cars to One Stop for many years and we have never have had any issues with the workmanship or employees they are very helpful and never do any work with out permission, when they see an issue they call to inform you before any work is done. We had to have some engine work done and Randel called to tell me he would like me to take a look at the oil build up in the valve cover and suggested a major cleaning, I saw what he was talking about and I did agree with what he suggested. Randel and Matt are very courteous and pleasant I will continue to take our cars to One Stop because I know the work that is being done is going to meet my expectations. One stop Automotive is a great team, highly recommend them do to mechanic work Tucson. Very reliable, great communication, very reasonable, accurate on the time frame on what they tell you your vehicle will be done by. Excellent customer service. Thank u One stop Automotive team. Honest, respectful, and trustworthy are the words to describe my recent experience with One Stop Automotive. Being new to the Tuscon area, I was nervous when I experienced some difficulty with my car. A friend recommended this shop and I am delighted to have found it! As a female customer I was treated with the utmost respect and when I picked up my car, the owner walked me through what they had found and what had been done. I highly recommend One stop Automotive to those new to the Tucson area, as well as anyone local who wants a positive experience with a shop you can trust. AWESOME! Always great service and super friendly staff. Always GREAT service. Has your best interests at heart. The whole staff care for your vehicle as if it were their own. I have gone to One Stop Automotive in the past and they always have great service. They always stay close to their estimate and are friendly and quick. My family and I have always been very happy with their work and we’ll continue to go there with all of our cars. I can’t say anything negative about this place. I’ve been taking my vehicles here for years and have given them a lot challenges. Matt is awesome working on my vehicle, even though I know he hates seeing it towed in. Randall is always willing to get me in and out the same day. I recommend them to anyone who needs there vehicle worked on. Excellent service. I bring both my vehicles here for maintenance and repair and won’t let anyone else touch my cars. Service is always honest and fair. I’ve also recommended many of my friends and family to these guys and they feel the same. I was referred here by a coworker of mine and everything he said about this business is true. The prices are very fair and reasonable, the quality of work is very good and the owner, Randall, is a very genuine and good guy. They were able to fix our brake problem and put my mother’s mind at ease. We will definitely be regular customers here. The service was great, they took me right in replaced my A/C hose and charged the system while I waited. I will return again, thanks for the good and fast service. THEY’LL RIP YOU OFF AND LIE, LIE, LIE!!! ESPECIALLY IF YOU’RE A WOMAN!! My fuel pump went out during the,heat wave in June. They gave me the best price by far, so I had them do it. It did the same thing, sputtered then wouldn’t start, 2 weeks later. Matt told me it needed a tune up. I even questioned the idea that it needed a tune-up, because how in the world would the sputtering problem with the gasoline occur because it needs a tune-up? But he assured me that it wouldn’t happen again. Oh it did all right an hour later when I drove back to Benson where I live. I barely made it home. I’m a disabled 55 year old woman who cannot possibly walk more than a few hundred feet. My mechanic at the shop in Benson took a look at it. He said that they did such a terrible job putting in the fuel pump. It was crooked, they broke the seal, and not all the bolts That was supposed to hold it in we r nt there! I was assured by Matt when I took it back the second time, that he double-checked to make sure that the fuel pump was put in properly. So either he lied to me about looking or he lied about it being done properly! Obviously I couldn’t trust it anything that was told to Me by Matt at this point. So I contacted my bank and I’m just using the charges. I’ve already gotten my money back! I have Chase Bank by the way. So if they do work on your car and screw it up, which at this point I’d say is a very good chance, contact your bank and get your money back. Maybe they’ll start doing better work if they want to stay in business. Super service job plus checked out recall on car. You just can’t miss when you take your vehicle to One Stop. Figured out a difficult problem, got it fixed with a reasonable cost and it runs like a champ. As always, fast courteous service and reasonable cost. I use and trust the service I receive from One Stop Automotive. I have an aging Ford Expedition and I have had just about every service performed on my truck by this auto service/repair company, and I’ve never had any issues with the work performed or the parts used. I just had a tune up with an oil change and transmission service performed, and now my truck drives very smoothly. Previously, I used a ford dealership for my services. Matt my mechanic at One Stop, replaced my extremely difficult to reach spark plugs (which I had done at the ford dealership 20K mi ago) and he showed me the Ford dealership did not replace the the back two plugs with new ones… It was evident by the color and brand for the plugs that the the dealership did not do as I had requested and payed to have done!!! It’s this type of service that brings me back time after time, for oil changes and larger repairs to One Stop Automotive. I had my truck worked at another shop to replace a wheel hub assembly. The very next day it was worse than before. I went to One Stop Automotive and they not just fixed the problem but caught other problems due to the previous shops mistakes. They replaced not only the hub assembly but also the 4 wheel drive assembly and the back breaks and rotors, and it was so affordable compared to all the other shops in the area. This will definitely be the only shop I’ll be bringing my truck to in the future. Awesome work guys. Thank you! As always great, very honest and dependable service. Randall and the Guys are terrific!! These guys were awesome! They are fast and honest, and didn’t charge an arm and a leg. I will definitely be going back to them for anything I need done! I highly recommend One Stop Automotive! Outstanding customer service, high quality work, and very reasonable prices! It is the only place I trust to service my car! One Stop is nice low key place to take your car. The service is friendly and reasonably priced. I have been going their for a few years now and have not been disappointed yet. Service was great. Needed a fuel pump that would cost over $600. Randall found a used one with low mileage for $55. Typical of the outstanding service that we receive at One Stop. I highly recommend that you bring your vehicle here for repair. Customer service is also outstanding. Thanks, Randall and crew. I took my car into One Stop Auto for repairs on 6/10/16. I was extremely satisfied with the work that was done. The owner Randall Miller is an excellent mechanic, and very courteous, professional, and thorough, as well as very friendly and personable. Above all, he is very honest in his fees for the work. All mechanics should be as good as Randall Miller. It is refreshing to know that I can trust my mechanic. I will definitely be back when I need more work. One Stop has been taking good care of our cars for many years and I highly recommend this professional automotive repair facility to everyone. I highly recommend One Stop. They have been taking care of my vehicles for quite some time. very pleased with the service I receive. Have recommended them to friends and family members as well. I have brought my car here ever since moving to Tucson & won’t go anywhere else. The fellows treat me with respect & the prices that I end up paying are more than reasonable. One Stop Automotive is Awesome! These guys are great! They got my power steering fixed in just a few hours. They always get the job done right and their prices are fair. I don’t think I’ll ever go anyplace else. I can recommend One Stop Automotive on Craycroft between 22 St. and 29 St. Very convenient location. The owner Randall introduced himself and both he and the other mechanic were friendly and professional. The office and the bays were cleaner than any I ever remember seeing. They did the work I asked — replace rear struts. Finished in less than half a day at a price less than the 5 other estimates I had gotten. Car runs quieter and the ride is smoother now. I took my roommate by when I went to pick up the car so he would know where One Stop was so he can get them to work on his van. Thanks Guys! I’ll be back. And by the way, I love your fish tank in the office!! Very honest, affordable and reliable shop. I won’t take my car anywhere else. It’s very hard to find high quality and trustworthy shops these days but you will get nothing less at One Stop. My entire family goes to them and I think I speak for all of us when I say that I cannot recommend them enough. Honest, reliable and highly competent mechanics. I’ve been going to One Stop for almost 10 years and the service is consistently excellent! I HAVE USED ONE STOP TO SERVICE AND REPAIR MY VEHICLES MANY TIMES OVER THE LAST FEW YEARS. ONE STOP AUTOMOTIVE HAS ALWAYS BEEN VERY FAIR IN PRICE AND GONE OUT OF THEIR WAY TO KEEP THE COST DOWN. Went in with an air conditioning problem, it was diagnosed in 15 min and I was out in 1 hr. Service has always been great, and prices comparable. I have been frequenting this shop for over a year now. I own 3 vehicles and will not take them anywhere else. The owner and staff have always been fair in pricing, courteous and professional. I often recommend One Stop Automotive to the tenants at the property I maintain as well as all of my friends. Great work at a fair price, I find I can trust them to fix it right the first time and they stand behind their work. I take all my cars to them from an oil change to a trans replacement. Customer service is great, they will communicate with you. After 5 decades of driving, I would have to say the quality of service at One Stop Automotive was one of the best. Also I am impressed by their knowledge, and fair pricing. We took our 2000 Dodge Caravan in because it was overheating. We needed a new water pump and thermostat. We took it in this morning and had it back this afternoon. The work was done quickly and efficiently. The entire cost was less than $200.00. We have taken all our vehicles to One Stop for more than 10 years because Randall and his crew do a great job at a reasonable price. Whenever anyone asks me about a good repair shop, I always recommend ONE STOP AUTOMOTIVE (Yes, I purposely shouted because they deserve it). I hope they stay in business until I can no longer drive. Thank you Randall and your crew. Best mechanics and very professional!! My car had a broken wheel stud and tail light. They quoted me a reasonable price and were very fast and efficient in their quality repairs. I would definitely recommend One stop to anyone who needs good quality service for their car. I found this shop to be very professional. They gave me an estimate that was well below other shops in town and they completed the work in a timely manner. What I really appreciated is the fact that they didn’t try to sell me something I didn’t need. If your looking for and honest and reliable repair shop, look no further this is the place. I brought my car in this morning to get the power steering pump replaced. I got my car back in the afternoon. I’m very happy with the service I received and how quickly it was done. My boyfriend and I take our vehicles to this shop quite often. Especially when no one else seems to be able to figure out what’s wrong. Randall and Matthew have always been honest with us and can figure out how to fix the problem. The prices are definitely very reasonable. They are a great company. They had to completely disassemble and reassemble my whole dash just to fix the door flapper for the AC unit on a 99 Suburban. Over the years we have lived in many places and dealt with dozens of auto shops. In our dealing we look for the smaller and trusting places to turn to when our vehicles need that extra care. We decided to give One Stop Automotive a try because of how close it is to work where we work. I thought my power steering pump was going out again and took it to One Stop Automotive for their opinion. Come to find out the problem was with our rack & pinion. One Stop Automotive did not leave us wondering when our car would be fixed we were kept informed the whole time and my wife was back to driving her car in no time. Great place, honest,good price, and only does what you need or want them to do. Been here a few times for 2 different vehicles and will return if in need of repair in the future. I came in to get my check engine light checked, they addressed the issues within the same day and at a very reasonable price. They also kept in constant communication with everything they were going to do with my automobile. Will definitely return. Known Randall for a long time. Always done good work; done in a timely and efficient manner. Went in for an oil change and a check engine light problem and everything was done smoothly- very good costumer service. Wrong part ordered at first; but did a good job and very nice. One Stop Automotive is the only shop in town I would trust with my vehicles. Would recommend them to anyone who needs an honest repair done right the first time for a reasonable price. There are a lot of shops out there with a lot of techs but only One Stop has been able to correctly diagnose my concern and get me back on the road everytime. Went to get an oil change. I only deal with One Stop for all my auto needs. I had an accident in January, and they were able to repair everything including auto body. They billed my insurance and kept me apprised of everything throughout the whole repair process. I highly recommend One Stop Automotive for all your auto needs. Both the owner and Mechanic are fabulous! ! My brake light keeps going out… wierd, but true…hopefully it won’t again! I was a walk-in but i only had to wait for a little over an hour. 🙂 they also jumped my vehicle so i could drive it over there. They are super professional and polite…they do a great job! Also, my A/C went out about a year ago, it was rusted really tight the piece that needed to be replaced….instead of giving up…like most mechanics would of done…he kept trying…and succeeded!!! I’m so grateful to have found this repair place!!! Everyone needs to go here! ! This was the best and I mean the best places I have EVER stopped at to get my vehicle fixed, I had several other places tell me different and trying to cheat me out of my hard earned money, but this place was honest and was excellent on top of the best customer service I have ever experienced! Thank you for your honesty and great work guys please keep it up! This shop has been my shop of choice for several years now. And as always the work is done on time and as quoted. Thanks for your professionalism. One Stop Automotive does excellent work! They are extremely courteous, professional and really care about the work done. Randall and Matt take the time to explain exactly what needs repair. All for a very fair price. I plan on taking all of my vehicles to One Stop,. Highly Highly recommend!!! I appreciate the extra service that was provided.. I will definitely be back, thank you!.. You can’t go wrong with One Stop Automotive. I’ve been taking my vehicles there for years. This last time was an emergency and I knew I would be in good hands. I have sent other people and their experiences with the team at One Stop have been excellent. Thanks One Stop! I have been using One Stop Auto for all of my vehicles for over 20 years. Here’s why: Trustworthy, integrity, know how & Never Trying To Overcharge Or Sell You Stuff You Don’t Need! I highly recommend One Stop Auto! Great service experience!! Low Price – High Quality – Done right the first time!! Matt & Randall are the best we have found!! All the places I have lived in the continental US and I have to say that this shop here is the most professional, courteous and by far the best mechanic shop I have ever been to! These guys are very knowledgable with both my vehicles and I wouldn’t trust anyone else to work on any of my vehicles!! We just move here from out of state and my passenger side windows on both the front and back would not roll up. We picked this place by random, and they could not have been more helpful. Even though they were busy, they took the time to get my windows up, and said I needed a new master switch. I will be bringing my car back to get the master switch replaced, and for all other car maintenance. They are the best! Randall and Matt are the best!!! This is the best auto repair shop I have ever been to. Mr Randall actually cares about his customers. I’ve used him now three or four times in the last month fixing up my Ford Flex. He even took time to drive my car around the block with me in it listening to stuff with me. I will use only this repair shop from now on. I recommend everyone here now. Thank for your searching for auto repair service in Phoenix, AZ, and Tucson, AZ, areas. We are pleased you've chosen GarageFly to help you with your automotive repair needs. One Stop Automotive is one of GarageFly's many user rated and reviewed auto repair shops in the Phoenix, AZ, and Tucson, AZ, areas. There are so many choices for automobile repair in Arizona; we feel it's important for you to be well informed. Please visit http://onestopautorepairtucson.com/ for more information about this automobile repair shop's services.